We recently completed our submission to the province’s oil spill regulations process, along with thousands of members of the public. GSA staff have spent a lot of time diving into the work of oil spill response, collectively reading through thousands of pages of spill response plans, after-spill reports, scientific studies and legal decisions. After all this reading and writing, we’ve had three heart-sinking realizations. The first is stark fact that the industry standard for marine clean up is an abysmal 10-15%. This is a shocking number, and it’s not talked about very much. Industry will talk about how quickly they deploy, but not about how well they contain and recover spilled oil. They will talk about the limitations of resources, technology and weather. Now, it’s true the technology is limited, and hasn’t changed much since the Exxon Valdez, and that we need more equipment, more ships and more labour dedicated to spill response. But on our coast, the response organization is owned by the fossil fuel industry. If they want more resources or more r+d into new technologies, they can invest. They could raise the bar above 15%, or they could refuse to move their product in the kind of weather that hampers clean up efforts. They never will, of course, because there is a lot of money to be made moving fossil fuels the way we traditionally have. Industry has a lot of financial incentive to keep things cheap, and governments are always mindful of resource revenues (even when that revenue, as in the case of the oil and gas industry, is rapidly declining). The second thing is that communities are not usually involved in oil spill response until it is too late. Our submission is strongly focused on meaningful community oversight of oil transits. We put forward that BC should adopt the model that has worked for Alaska, Regional Citizens’ Advisory Councils (RCACs), as a starting place to consider what community oversight in BC would look like. RCACs are recognized around the world as a best practice, to the degree that US Democrats and Republicans in Florida, not traditionally groups that are in alignment, both think they should be part of oil spill planning in the Gulf of Mexico. So why haven’t they spread further? The answer is, at least partially, because their very existence holds the fossil fuel shippers to a higher, and therefore more expensive, standard. Fossil fuel companies spend a lot of money lobbying governments to make sure that shipping their product doesn’t get more expensive. The Alaskan RCACs were established in the wake of the Exxon Valdez disaster, when public trust in oil spill response was practically non-existent. Short of that kind of disaster, the political will to make moving fossil fuels more expensive is hard to find. And at least some of that’s because of the third thing we discovered: regulatory capture. Regulatory capture is defined as “the result or process by which regulation, in law or application, is consistently or repeatedly directed away from the public interest and toward the interests of the regulated industry, by the intent or action of the industry itself”. And it is unfortunately commonplace in Canadian environmental governance. In terms of the oil and gas industry, this is definitely not limited to oil spill response. We’ve seen BC’s climate targets re-written in closed-door meetings with oil and gas companies, pipeline proposal assessments tainted by secret meetings with industry insiders, regulatory reports on pipeline breaches altered after the company was given drafts. In Alberta, the regulator reports that median clean up of pipeline spills is 100%, as compared to 3.4% in North Dakota. Regulatory capture is so pervasive that the former leader of Alberta’s Official Opposition says the oil industry has created a “deep state” in Canada. Governments are besieged by fossil fuel industry lobbyists, and the relatively low standard of regulations for oil spills are one result. Georgia Strait Alliance is gearing up to be one of the only NGOs to take part in the technical working groups that the Province of BC is putting together to look at new oil spill regulations, with three of our staff participating. It is, not surprisingly, a very industry-heavy process which is why our participation so important. We’re going to advocate strongly for community oversight, for a process that is paid for by the industry but not controlled by them. We think independent science and analysis should be driving the oil spill regime, that we have transparent, comprehensive and compulsory rules for fossil fuel shippers. We think that shippers should demonstrate they can clean up spilled product, and if they can’t, that they are limited to moving it at times and in places they can. We’ll be doing our part to make your voice heard – and posting details and information on social media about next steps. Like and follow our Facebook page, follow us on Twitter, and Instagram. We are working hard to be a voice for the community amongst industry, representing those who love the strait. There will be an end to technical working groups and a follow-up opportunity for public engagement, and we will need you. You can be a part of the work now by amplifying the information we post, by talking to your neighbours, and by keeping in touch. WCMRC will not start any action toward spill response until the air quality is safe which will delay all first responders from putting out books etc. For several hours. When there is a spill of diluted bitumen or other oil product about 20% of the chemicals vaporize and spread whichever direction the wind is blowing. WCMRC has hand held AQ monitors and will not go near the spill until the levels of benzene are safe/ zero. They do not have self contained breathing apparatus (SCBAs) so they won’t go near the spill for some time. Meanwhile the spill is spreading and the damage to the environment is happening and the poisonous chemicals are blowing over all of the people in the area. 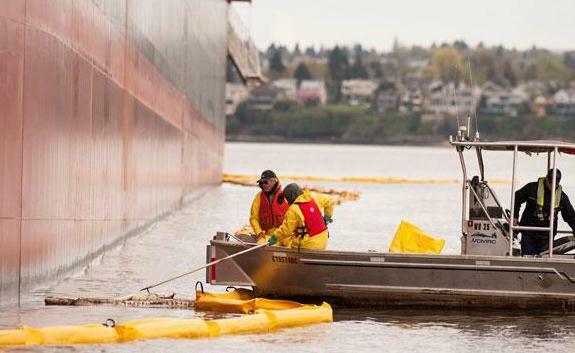 By the time the spill response is mobilized, the impact to the health of the people and the marine mammals is already affecting their respiratory, cardiovascular, neurological and immune systems. We went up against Standard oils idea of clean up in the 1971 San Francisco 800,000 barrel spill, bunch of us 10 ft apart with rakes rolled in heavy oil made a dump truck load, Standard oil guy’s started digging a big hole further up the beach and were going to bury it, it didn’t happen. 3 weeks 24/7 lived in an army tent Keep an eye on them, it’s your turn. It is of particular concern that the Trudeau regime’s recent “North Coast Tanker Ban” Act is riddled with a 12,500-deadweight ton LOOPHOLE, -which allows for, and perpetuates the Alask-bound ATB petroleum tanker business which delivers domestic fuels to Panhandle Alaska by, on average, one 10,000 deadweight ton load every 2 weeks, right up every inch of the BC Coast Inside Passage, including the Salish Sea, Johnstone Strait, Queen Charlotte Sound and Hecate Strait. After the 2016 wreck of the “Nathan E Stewart” near Bella Bella, which cost at least $100 million to remove and “clean up,” large areas of Heiltsuk fishing grounds are still contaminated and the American ATB traffic carries on unabated. The obvious, simple, reasonable and pragmatic solution is to require that this traffic be relegated, in properly seaworthy vessels to the already established and designated offshore tanker sealanes, where all the rest of the tanker traffic must go. Thank you very much for your hard work on this!